You may be familiar with, or at least have heard of, the book Don’t Sweat the Small Stuff by Richard Carlson. Carlson further explains in the book’s subtitle that it’s all small stuff. Therein lies the challenge. It’s all small stuff, and small details never are small, insignificant or forgettable. Do you remember this old proverb? When it comes to details, the small ones never are small. All of them are important. Whether it be a product requirement, quality expectation, customer need, board member request, or part of a message to explain a vision, the details are important to ensuring results align with needs, goals and strategy. So absolutely sweat the small stuff, because it’s all small stuff! Just as small actions are never small when trying to accomplish big goals, small details never are. In fact, it’s often the small details that really thrill people enough to tell their friends, exert extra effort and understand their role in something much bigger. Harrison Barnes, the founder and chief executive officer of the Employment Research Institute, understands this rule. Not too long ago, he posted an article titled “Pay Attention to the Details.” In it, he says, “One of the most important things you can do in your career, business, and life is pay attention to details.” Indeed! He described the value and importance of details and concluded, “Where people win in business, in their careers, and elsewhere is often in the small print.” Those are the details! Details always add up, just as the proverb above illustrates. The nail of a horseshoe can lose an entire kingdom. The best leaders communicate this importance to enable people to see the importance of their roles and responsibilities to the larger whole. Mike’s job was to understand things like the dynamic load pressure relative to twin supersonic plume resonance and the implications from such pressure. He also researched the implications of Mach wave emission from supersonic jets operating at high temperatures and conducted a number of experiments to understand the impact that aeroacoustics friction at supersonic speeds had on aircraft material and the people inside. As noted, he’s a rocket scientist! The reason Mike is important here is his understanding of physics. To accomplish any big goal, you have to understand physics. Like me, you may not have an advanced degree in physics. Mike likely would say, “That’s fine. Even without a degree in physics, you likely remember playing with dominoes as a kid.” Again, if you’re like me, your dominoes were all the same size and rectangular, and you enjoyed lining them up on end in a very even row (or perhaps with an occasional curve) before knocking one over and then watching the rest of them tumble one at a time when hit by the falling domino placed before it. That’s physics! The action and subsequent reaction of each domino is caused by mass in motion. The interesting thing about this is that, based on the mass and motion, a single domino can topple another that’s 1.5 to 2 times its size in its path. That’s important because your actions are similar, and you need them to be so in order to achieve any goal or desired future state. The reason why is because no goal of yours can be achieved in a single action. Any big goal is accomplished by aggregating small(er) accomplishments over time and aligned to the next larger one. In other words, big things are only accomplished one small detail at a time, added up over time. Think back to when you were a kid playing with the dominoes. Think about the vision or end goal to see the last domino fall. Before that occurs, you need proper preparation, a strategy, and a plan for how the dominoes will be organized. You also need alignment to assure one domino’s mass in motion will hit its next target and have the energy to topple it over and into the next domino. Every action of the domino will have a reaction. You have a similar effect as a leader. Your every action is affective — for better or worse. Whether you intend for it to affect or not, it does, and there’s a subsequent effect. So, act accordingly: Prepare, plan, align, connect and rely on your momentum (mass in motion) to accomplish smaller things that accumulate to much bigger things. The best leaders look out for the details of the horseshoe nail. They know the kingdom relies on it, just as Mike knows of the catastrophic implications of a little friction at supersonic speed. 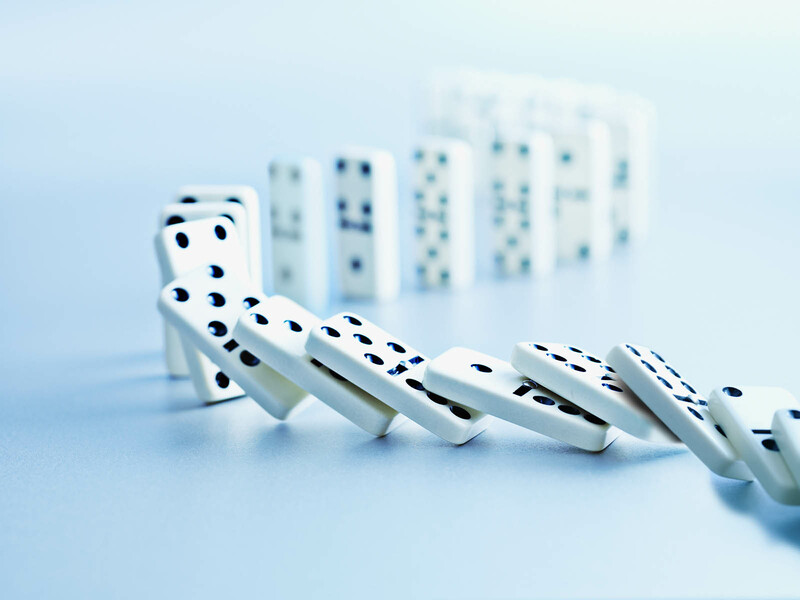 You don’t need to understand physics to be a great leader, but if you understand dominoes, you can appreciate and understand the need to sweat the small stuff.